So I've found a way to scrapbook.. I do a little bit each time I'm passing my craft room! Takes me forever to get a layout done, but it's better than nothing.. I completed this layout following the sketch #348 over at Sketches in Thyme and was quite pleased with the results, AND I got to use up photos of Alexander that I've been meaning too for ages. Awesome use of the sketch, I love the sprinkling of sequins that you used! Thanks for joining us at Sketches In Thyme! I also use the same method to scrap! You did a cheerful layout, very nice. 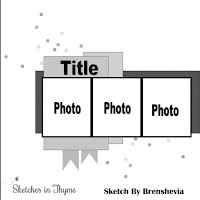 Thank you for sharing it with Sketches in Thyme.